VMware Cloud Foundation is a unified SDDC platform that brings together VMware vSphere, vSAN, NSX and optionally, vRealize Suite components, into a natively integrated stack to deliver enterprise-ready cloud infrastructure for the private and public cloud. The Cloud Foundation 3.7 release continues to expand on the SDDC automation, VMware SDDC stack, and the partner ecosystem. VMware announced new the release of VMware Cloud Foundation 3.7. The new version of VCF introduced a number of new features in this new release, and I will share a short overview of some of them. VMware Cloud Foundation on VxRail – Provides an integrated experience on Dell EMC VxRail with the automated life cycle management of the whole stack. Standalone Automated Deployment of vRealize Suite Lifecycle Manager – Enables standalone automated deployment of vRealize Suite Lifecycle Manager. Automated Deployment and Management of Horizon Infrastructure for Virtual Desktops and Applications on VMware Cloud Foundation – Enables automated creation, expansion, and deletion of Horizon workload domains. Common Cloud Builder appliance for VMware Validated Design and VMware Cloud Foundation – The Cloud Builder appliance is used to deploy both products. Every new release of Cloud Foundation there will be an updated software Bill of Materials (BOM). In this latest release below is the BOM which contains software components version build number etc. In addition to including Horizon 7.7 in the BOM, Cloud Foundation 3.7 introduces the ability to automate the deployment and configuration of the Horizon infrastructure using the VMware SDDC Manager. This capability adds a new construct in Cloud Foundation, referred to as a “Horizon Domain”, which is used to overlay Horizon Software on top of one or more Virtual Infrastructure (VI) Domains. These VI domains provide the infrastructure that makes up Horizon PODs and provides the compute, memory, and storage resources necessary to run the Horizon desktops. Cloud Foundation users are sure to appreciate the “push button” approach to expanding the VI domain infrastructure capacity when needed. Cloud Foundation 3.7 also introduces integration with Dell EMC VxRail. VMware Cloud Foundation on VxRail is a co-engineered Partner Solution delivered by Dell EMC in partnership with VMware. This solution, when made available from Dell EMC, will align the workload domain and lifecycle management capabilities in Cloud Foundation 3.7 to provide centralized infrastructure management and comprehensive lifecycle management of both hardware and software components. Through a vCenter Plugin that communicates with the “VxRail Manager” virtual appliance, administrators will be sure to appreciate the detailed inventory, hardware monitoring, and hardware visualization capabilities. VCF on VxRail will also provide a number of Serviceability and Support Features, such as integration with Dell SRS (a proactive phone home capability), Dell eServices (including online chat with support engineers), and automated hardware maintenance tasks, including the replacement of disk drives and power supplies. Be sure to check back for an announcement when VMware Cloud Foundation on VxRail becomes available. With this release is the ability to deploy the vRealize Suite Lifecycle Manager (vRSLCM) independent of other vRealize workflows in SDDC Manager. With this change, vRSLCM is now treated as a first class object that can be deployed at any time. This will facilitate future features such as applying software updates to vRealize Operations and vRealize Automation through integration between vRSLCM and SDDC Manager. NOTE: VMware Cloud Foundation 3.7 must be installed as a new deployment or upgraded from Cloud Foundation 3.5.1. For more information, Check the Installation and Upgrade Information. Also always refer known and resolved issues and compatibility before proceedin the upgrade. 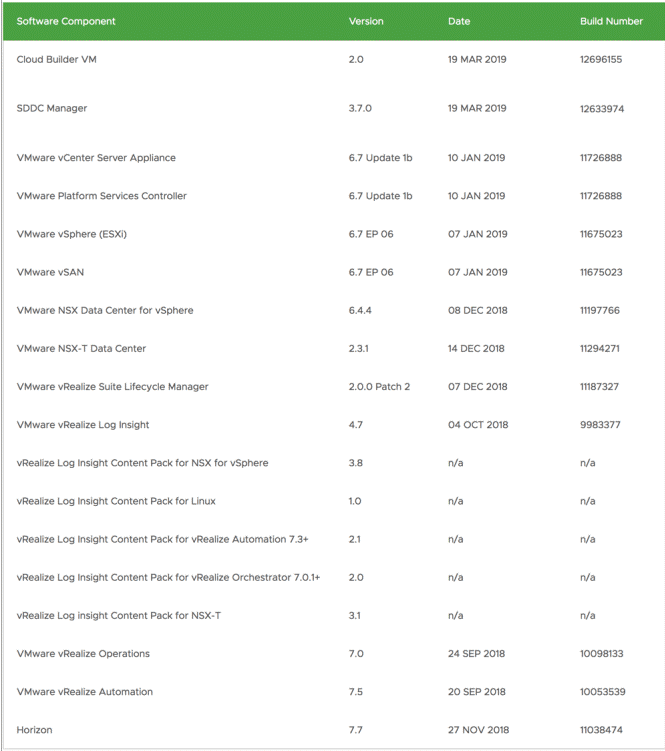 Refer to VMware Cloud Foundation 3.7 Release Notes.